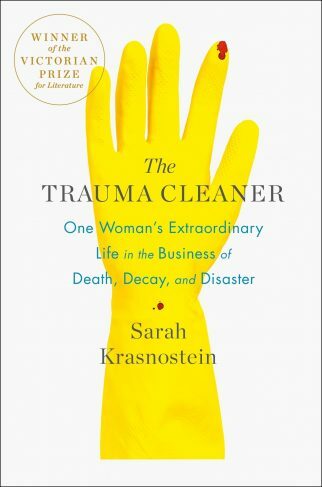 The Trauma Cleaner: One Woman’s Extraordinary Life in the Business of Death, Decay, and Disaster by Sarah Krasnostein is a heavy book both about the heavy work of and heavy life led by Sandra Pankhurst. This is not the feel-good story it sounds like it could be. Ms. Pankhurst’s experiences range from cleaning the homes of hoarders to natural disaster remediation to crime scene clean up. And from the start, we know that Sandra is dying a slow and painful death, despite her strength, humor, and joie-de-vivre. Through out the story, Ms. Pankhurst details memories, as best she can, of her life of abuse, tragedy, confusion, illness, and ultimately redemption. As you read, though, you find out that her entire life is an ode to dying, both by choice and by circumstance. And the author is recording that ode for posterity. Sounds like an interesting read, right? In theory, yes. In practice, however, while I was being told about Ms. Pankhurst through the eyes of the author, Sarah Krasnostein, I seemed to be learning more about Ms. Krasnostein than anyone else. In fairness, in the first chapter, Ms. Krasnowski calls the book a love letter to Ms. Pankhurst, or perhaps a love letter about her life. And it is true that that I was told that this is a biography like no other I’ve ever read. But I felt a little hoodwinked in that I was very much expecting to discover Ms. Pankhurst, when really Ms. Pankhurst seems to be the vehicle through which I learned about Ms. Krasnostein. All along, despite Ms. Pankhurst’s insistence to the contrary, it seems that Ms. Krasnostein wants to view Ms. Pankhurst’s life with optimistic glasses, and is trying to get us to follow suit. She’s too involved, too close. To be sure, the book is full of interesting, funny, questionable, painful, and heartwarming anecdotes that Ms. Pankhurst relates about her life to varying degrees of reliability. But in the end, every one of the stories and experiences reflected back on the author in what felt like a backwards confessional. Call me a traditionalist, but I want the biographies I read to be about the person about whom they are written. For me, the author should be mostly invisible. I recommend this book to anyone who is looking for a challenge, emotionally and literarily (yes, it’s a real word). Ms. Krasnowski spends time with her words, savoring and revering them, and expects you to do so as well. But expect the book to be as much about the author as it is about the subject.